Viajero Montevideo Hostel i Montevideo, Uruguay: Bestill nå! 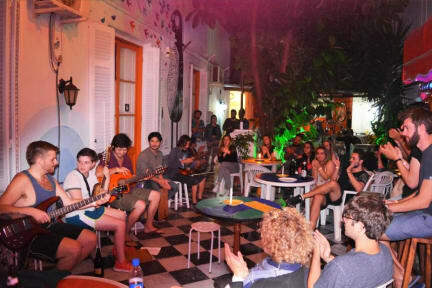 El Viajero Downtown Hostel & Suites is located in the downtown of the city, near the main street 18 de Julio.We offer the comfort of a Hotel combined with the fun and relaxing atmosphere of a Hostel. All our rooms have Air conditioner and toilet ensuite. Dorms ensuite, spacious and well -equipped kitchen, hot water 24/7, a great solarium with BAR, computers with free internet access, Wi-Fi, bike rental, laundry service, cable tv, Dvd & Media Player, public telephone, bus tickets sales, Hostel reservations for other destinations of Uruguay are part of our services. It is a few minutes away from the main tourist attractions in downtown (Cagancha square, Independencia square, Rambla, Ciudad Vieja y Rodo Park). El Viajero Downtown Hostel & Suites is your best option if you want to be near everything, in a great atmosphere and do friends! We are part of a chain of hostels with presence in Colombia and Uruguay, visit us in Cartagena, San Andrés, Salento, Montevideo, Colonia and La Pedrera. Welcome to our Travellers community! Hadde kort stopp der, kun ei natt! Atmosfæren var bra, stilig fellesområde, hyggelig personalet. Kun en ulempe, mitt rom var rett ved baren, så det var bråkete fram til 12. Men sånn er det å bo på hostel. Men om du er ute etter livlig hostel så er dette plassen for deg!